I was outside the evening of May 1 when my daughter pointed to the sky and said "what's that?". I turned around to see a flock of about 40 large-looking birds. Looking with the naked eye, they seemed to be some sort of shorebird. I figured I'd missed my chance at identifying them as they disappeared into the distance. However, a couple minutes later, another flock; then another. The waves of birds kept coming every couple of minutes, giving me time to get my binoculars and camera. With my binoculars, I was amazed to see each bird had a large curved bill. After some further inspection, it was clear these were White-Faced Ibis, a marsh bird that is a usual visitor to Arizona during migration. 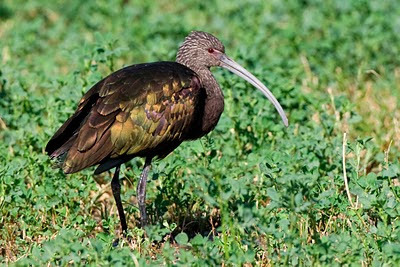 White-faced Ibis look very out of place in a desert setting, but they will land and even spend some time in desert wetland environments. Photographing a bird in the sky is always a challenge given the strong backlighting that often exists. This evening was no exception, however the setting sun did result in some interesting effects. 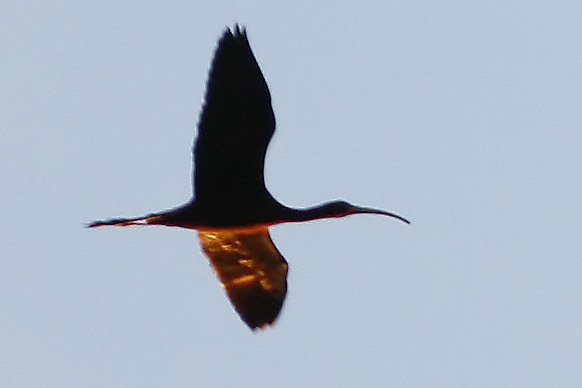 The above photos are the clinchers for this being White-Faced Ibis. When considering down-curved billed birds, Curlew and Whimbrel are also possibilities, but neither extend their necks as much as the White-Faced Ibis. Further, neither have bills as bulky, and neither demonstrate the short "finger" feathers on the tips of the wings. 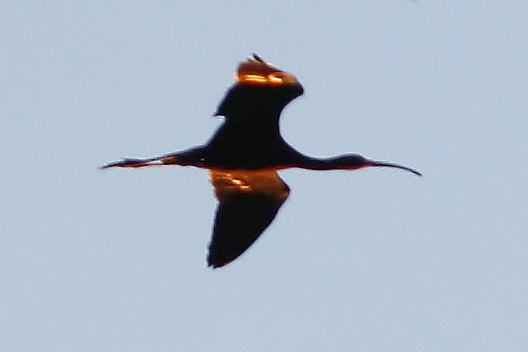 And I'm assuming these were not Glossy Ibis simply due to the numbers. Around 300 (conservative) to 500 flew over, while Glossy Ibis are very uncommon in AZ. Lovely shots! Thank you for posting them. I am a big fan of ibis! Thanks for posting this. 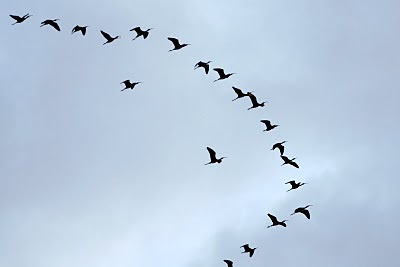 Yesterday, I saw a large flock (100 or more) ibis's flying. They were a long way off and it was getting dark, but I thought they were ibis's and your post confirmed it.